Another name for this category is “Welcome to Seymour Dental”. As time has moved on the amount of material on the website has grown. The patient guides are a gathering of key items of information for all patients to know. This section of the website has common questions that are asked of us. This also has some links back into the patient guides through the blue tag box. If there are any questions that need to be answered let us know. 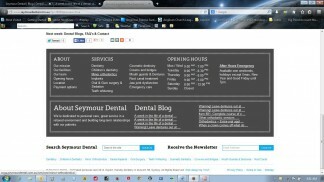 The blog section of the website also has an “About Seymour Dental” box with links to the latest blog articles. We are trying to make life easy! Please email us via the website for any queries, or even call the surgery for human contact. When you are ready, make an appointment for all your dental needs at Seymour Dental.